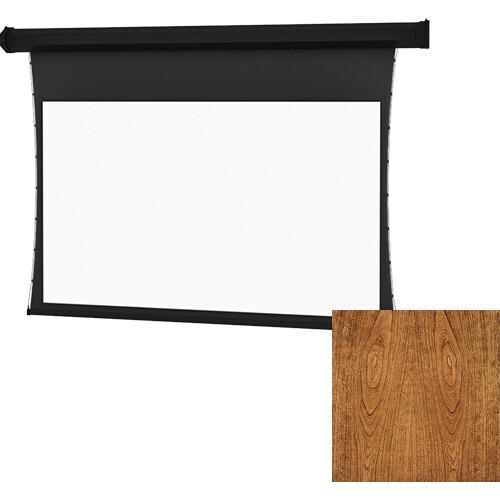 The Tensioned Cosmopolitan Electrol 52 x 92" 16:9 Screen with HD Progressive 1.1 Perforated Surface (Light Oak Veneer, 120V) from Da-Lite is suitable for wall or ceiling mounted installations. HD Progressive 1.1 Perforated is ideal for applications where projector brightness and screen size require an increase in gain. The perforated white surface offers true color reproduction and fidelity, and allows for the installation of speakers behind the screen. It has a cone of 170° with a gain of 1.1.